Part 2 and conclusion of the Follow-up Expose on Uma Inder. We have also contacted Yoga Alliance, of which Uma is a member and below is our email correspondence with them. It has come to our attention that a yoga instructor named Uma Inder is a member of your program. Uma is being accused for abusing her power as a teacher to manipulate, exploit and damage her students. Please find enclosed a link to an expose on Uma Inder, which will provide some of the exploitations, manipulations and events of her past abuse on students. We ask that you prevent any future students from her abuse by reading the allegations presented in this expose and terminate your work relationship with her as it is a tremendous liability if a complaint comes from any of Umas students. This was Yoga alliance’s response back to us. Thank you for coming forward to share your thoughts in your email dated Wednesday, April 25 to Yoga Alliance. I honor your request for understanding regarding Yoga Alliance’s policy for responding to and handling allegations of misconduct by a credential holder. While Yoga Alliance does not criminally investigate reports of criminal behavior or sexual assault, we do take these reports seriously. 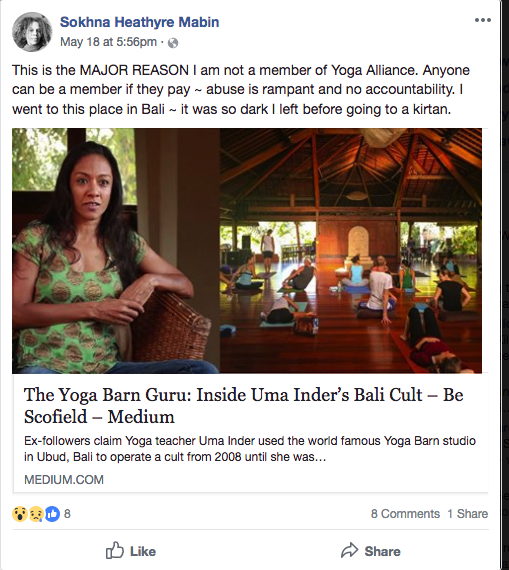 If you have directly experienced sexual misconduct by a credential holder and are interested in pursuing a grievance within the scope of the Yoga Alliance credential, you can contact me, Leigh Evans, at levans@yogaalliance.org or via phone 571.319.0824. My general office hours are Monday – Friday 8am – 4pm (ET). If you are interested in reading more about the next steps, I invite you to review our Policies page for further information. · Whether or not we can leave a voicemail if we miss you. You are more than welcome to have a support person – friend, family, spiritual advisor – or other trusted individual, with you during the call. Again, thank you for taking the time to write to Yoga Alliance. 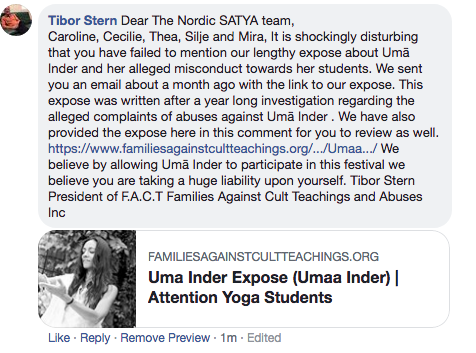 We are coordinating with the alleged victims of Uma Inder’s abuses to directly give their individual complaints to Yoga Alliance. The notion that there are only a couple of alleged victims who have come forward with allegations against Uma’s abusive misconduct couldn't be further from the truth. Here is the most recent complaint. As we stated earlier some of the institutions have discontinued their relationship with Uma. For example, the School of Sacred Arts, Yoga Barn and the latest is the No Mind Festival in Angsbacka. 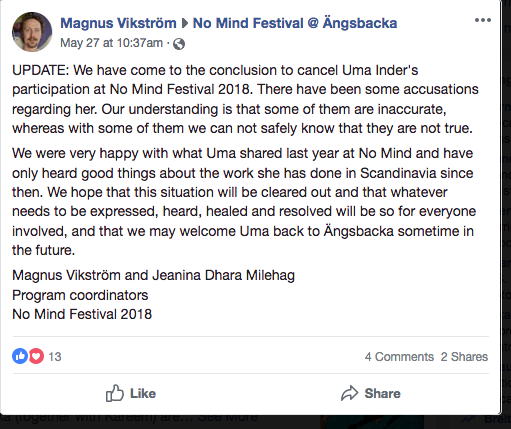 Unfortunately, we are still in the processes of getting the Nordic festival in Sweden to discontinue Uma’s employment. 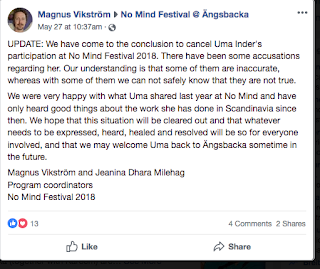 Here is our latest comment on the Nordic Satya’s Facebook post regarding Uma’s participation at the upcoming festival. It has also been brought to our attention that Uma has been selling her “health products” without proper government certification. According to the allegations found within the complaints received against Uma Inder, it is our opinion and belief that Uma may be acting as a cult leader that seems to severely damage her followers in many ways. We believe Uma Inder’s recruitment, indoctrination, and control techniques are typical to that of destructive high-control/demand groups (as per our analysis using the B.I.T.E. model). 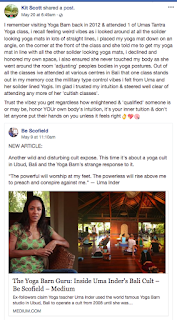 According to the complaints, in our opinion it seems Uma Inder has no regard for the physical, mental, emotional and financial well-being of her followers. We believe her goal is to psychologically break down students in the name of “transparency” and “enlightenment” for control and exploitation purposes. 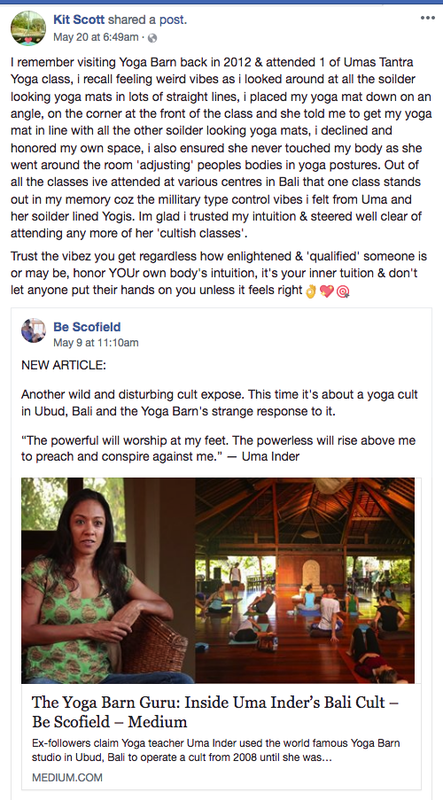 In our estimation, we believe Uma Inder may be very dangerous and advise potential students to think twice before becoming a student of this yogi guru. We commend all of the brave ex-students of Uma for finding the courage to come together and speak out in an effort to warn potential students and stop the alleged manipulation and abuse. If you have any information about Uma Inder and/or her group that you would like to share, please contact us immediately. 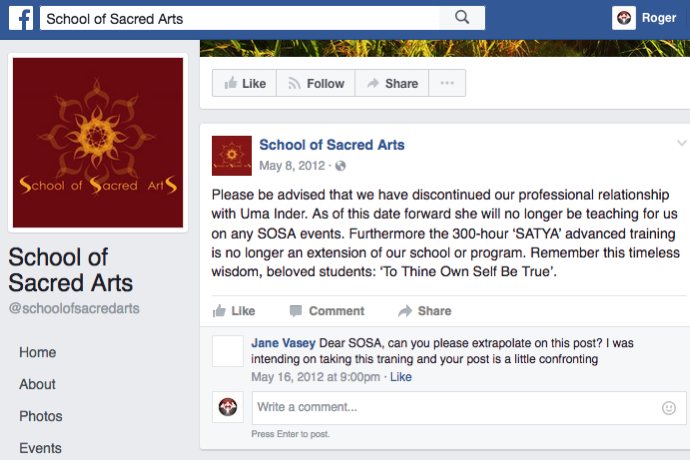 Please note: This expose was conducted upon receiving allegations and evidence against Uma Inder by ex-students. The purpose of this expose is to warn, educate, save lives and to protect any potential victims. It is absolutely not intended to slander, libel or harm anyone mentioned in the expose. In Conclusion we at F.A.C.T. have an obligation to our followers and the alleged victims to expose the truth. As such we will continue to inform and educate all future institutions and possible students of Uma. There will always be some opposing views from Uma’s believers and followers. That is the power of undue influence! Those who don’t fight EVIL empower EVIL!